Free shipping on all orders above Ksh2000 to Nairobi CBD via Chania Travellers Sacco. The TCRT5000L Infrared Reflective Sensors are great for detecting lines and edges. They can also be used to for close range obstacle detection. These sensors transmit an IR infrared beam and then measure the reflection. They work best when the measuring a surface that is a few centimeters away. The robots microcontroller brain reads the value of reflectance to decide how to proceed. A table edge can be detected when reflections from a table suddenly stop. Similarly, a black line drawn on a white surface can be detected when the reflection is absorbed by the black colored line instead of being reflected by the white colored surface. Close obstacles can be detected by the presence of some reflection. Of course, the success of reflective sensors depends greatly on the surfaces being detected. Overall, these sensors are great for edge detection and line following. For obstacle detection, you might want to use these in conjunction with other sensors, such as ultrasonic distance sensors, for a more robust solution. 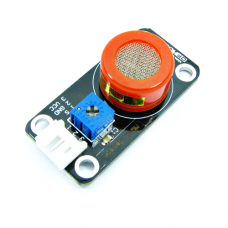 This Line Tracking Sensor can be used to detect black lines on white surface or vise versa for smart..
Use this 3 mm IR Transmitter and Receiver pair to build object sensors, colour sensors, line se.. 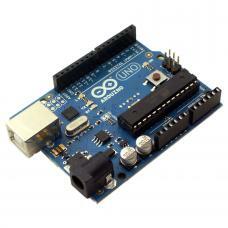 The Arduino community has come up with the latest revision for the Uno board. It is a beautifully de.. The analog gas sensor - MQ2 is used in gas leakage detecting equipments in consumer and industry mar.. The MQ7 is a simple-to-use Carbon Monoxide (CO) sensor suitable for sensing CO concentrations in the.. The HC-SR04 ultrasonic sensor uses sonar to determine distance to an object like bats or dolphins do..
BRASS LIQUID SOLENOID VALVE - 12V - 3/4"
Control the flow of fluid using the flow of electrons! This liquid valve would make a great addition.. 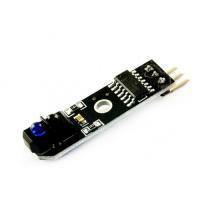 The DHT-22 is a low cost humidity and temperature sensor with a single wire digital interface. The s.. Need some indicators? We are big fans of these diffused red LEDs, in fact we use them exclusively in.. 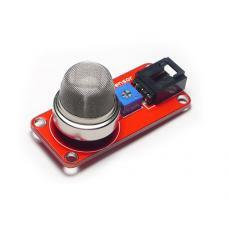 This is a pre-wired and waterproofed version of the DS18B20 sensor. Handy for when you need to measu..
OverviewSensitive to flame spectrumFeatures wide range voltage comparator LM393Adjustable sensitivit.. Description:The AFHDS 2A developed by FLYSKY is intended for all radio control models. It offers sup.. Welcome to the Nerokas Online Store. Nerokas Engineering Solutions is an open hardware facilitator, providing the tools necessary to help inventors and enthusiasts make their ideas a reality. We supply electronic components and offer guidance and expertise where we can to our customers. We feel it’s our duty to educate and inspire young minds interested in automation and to this end we make available the tools and equipment required, at very affordable prices. You won’t find prices that beat these. Happy shopping! Powered by Nerokas © 2018.